So, you’ve decided to take the plunge and teach abroad in China! One of the things that will be an asset to learn is the art of bargaining. Many of the prices you come across can usually be bargained down whether it's for groceries, electronics, or even gym memberships. You will come to realize that with a little patience and persuasion you can easily save yourself money. Normally most people today utilize the Internet to find the best prices, online retailers usually can sell items cheaper than local stores while those that like to touch and test the product beforehand use it to find out the lowest local prices. However, if you choose to take an adventure and wander outside the normal routine that you may be accustomed to, a whole new world of possibilities will be available to you. Anything from fake brand name clothing, tailored made clothing, laptops, cellphones, vegetables, fruits, and a myriad of other items can be bargained for. 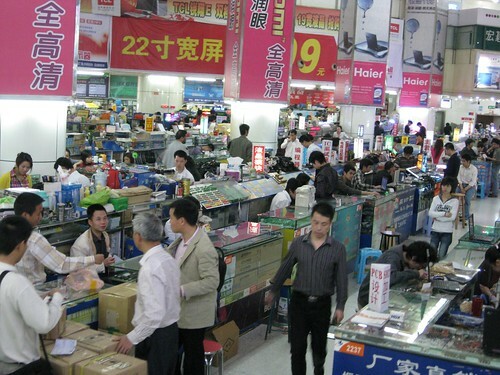 There are buildings with hundreds of vendors selling electronics, tailored made clothing, or fake brand name items where there are no listed prices and everyone gets a different price quote. Be warned if you don’t look Chinese you will be swarmed as soon as you enter these places by shopkeepers offering you their wares at a “friend” price. You may be alarmed to know that these “friend” prices are often more than five times the price you could pay. Initially you will be somewhat uncertain because you have no idea what fair prices for any of these items are. You are only aware of how much would you want to pay for these items and be happy if you walked away. I would advise that you don’t wander around and then have your heart set on a particular item because if you do so you will absolutely be ripped off. Initiate conversation with a shopkeeper and ask for the pricing of particular items, such as coats, t-shirts, belts, shoes, etc. Don’t be swayed by the shopkeepers saying that their items are the best and that they are giving you the best price, they will all be trained to do so. Personally, I would advise going below 20% of their initial asking price and as they balk just walk away. Most shopkeepers will call out a lower price to you but continue to pay them no heed. Keep the price they stated in mind and as you go to the next stall think about going around 25% of the previous price and negotiate from there. Once you think you have come to bottom with the current vendor go a third party and state a price slightly lower with the confidence of somewhere who has been there before. Stating the price lets the vendor know that they won’t be able to gouge you on pricing. Remember to have fun with bargaining, it’s a way of improving your negotiation skills with people and not something that should cause you frustration. Bargaining, like teaching abroad is as fun as you want it to be and they will both reward you with great deals!